Motorola won’t be taking a minimal approach to smartphone releases in 2017, according to an image posted by @evleaks. The image appears to be from some sort Motorola employee or investor type gathering that showed off the entire line-up of incoming devices, including new Z, X, G, E, and C models. 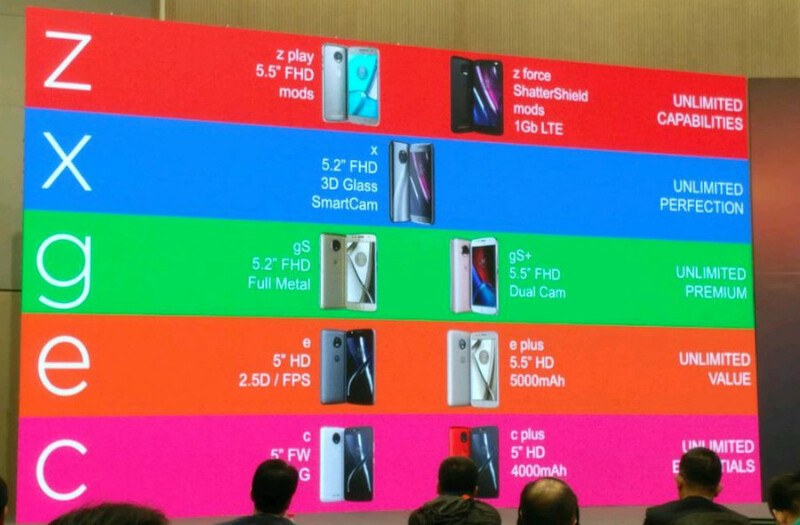 The image mentions new Moto Play and Z Force models that feature “unlimited capabilities,” a new Moto X with “unlimited perfection,” new Moto G devices with “unlimited premium,” Moto E phones with “unlimited value,” and Moto C units with “unlimited essentials.” There are nine phones in total on this slide, so maybe Motorola should have gone with “Unlimited Phones” as well. The devices to pay attention to here are the new Z Play and Z Force, along with the new X, which @evleaks says will launch as the Moto X4. These are the upper tier of the line-up and devices we are likely to see here in the US at some point. We have already seen leaks surrounding the new Moto Z devices, but a return of the Moto X might be a nice addition. The Moto X line in the past was always one of our favorite releases each year, and this one in particular is referenced as having “3D Glass” and a “SmartCam.” It could be that Motorola will really focus on a premium design, along with an affordable price point. In terms of launch, well, we don’t know. My guess is that we’ll see new Moto products within the next couple of months. Last year, Lenovo showed off the Moto Z for the first time at Lenovo Tech World in June, though there doesn’t seem to be another Tech World lined up for 2017.